Preschool Staffing Solutions is a specialist recruitment company providing both temporary and permanent staff to early childhood centres, afterschool programmes and holiday programmes throughout New Zealand. We are proudly New Zealand owned and operated with our head office based in Rangiora, Canterbury. 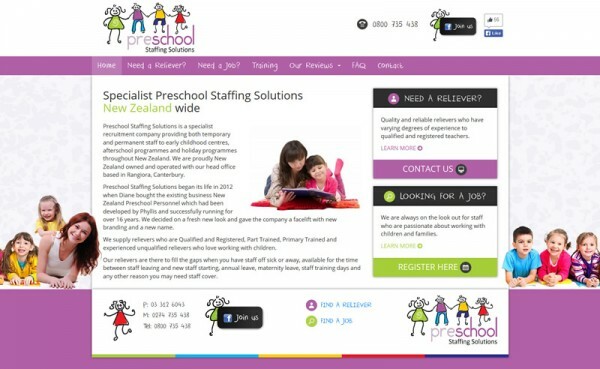 Preschool Staffing Solutions began its life in 2012 when Diane bought the existing business New Zealand Preschool Personnel which had been developed by Phyllis and successfully running for over 16 years. We decided on a fresh new look and gave the company a facelift with new branding and a new name. We supply relievers who are Qualified and Registered, Part Trained, Primary Trained and experienced unqualified relievers who love working with children. Our relievers are there to fill the gaps when you have staff off sick or away, available for the time between staff leaving and new staff starting, annual leave, maternity leave, staff training days and any other reason you may need staff cover. Preschool Staffing Solutions teams are being set up in other areas as needs for new relievers arise.